Breakfast volunteers: Lisa Gottlieb, Shana Kimball, Bridgette Carr, Jeff McCabe, and Maria Bonn. “We call it a breakfast salon because we’re not a restaurant. 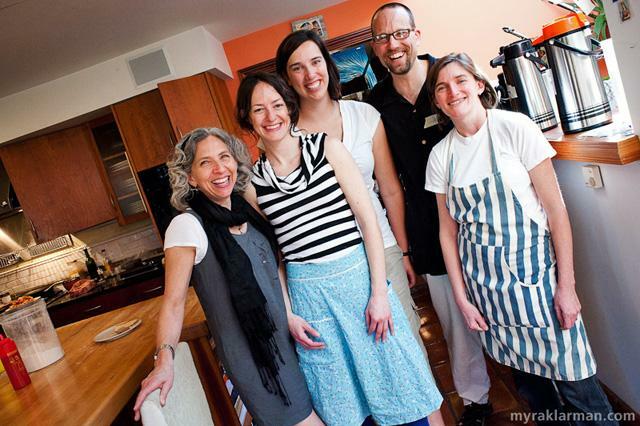 We’re making food for family and friends, people who are interested in supporting the local food economy, who want to come and have a good time on Friday morning before they go to work,” says Gottlieb. The idea is, it’s locally grown food, cooked for you by local chefs, with all the proceeds going to support Michigan farmers. Selma Café is on Ann Arbor’s west side. You can’t miss it. Their whole front yard is a giant garden, with onions and sweet potatoes and beets. Today, there's a hunk of prosciutto on the counter, and a guy with a little blow torch caramelizing the top of the bread pudding. Claire Rice is here for breakfast, and she also sometimes volunteers to wait tables. Lisa and Jeff have raised $90,000. A third of the money goes to buy the food from local farmers for the breakfasts and the rest goes to build hoop houses. Those are lightweight greenhouses that allow a farmer to grow food year-round. These hoop houses don’t have to be on farms. A couple have even been built in downtown Detroit. Devlin built her hoop house with a loan from the money raised at Selma Café. Her hoop house, like all the others, was built in one day by volunteers recruited at the Café, and some of the food grown in the hoop houses comes back to the Café. You might see greens on your plate in February.